The Hyundai Veloster N, especially with the Performance Package, ticks all my cheap performance car boxes. 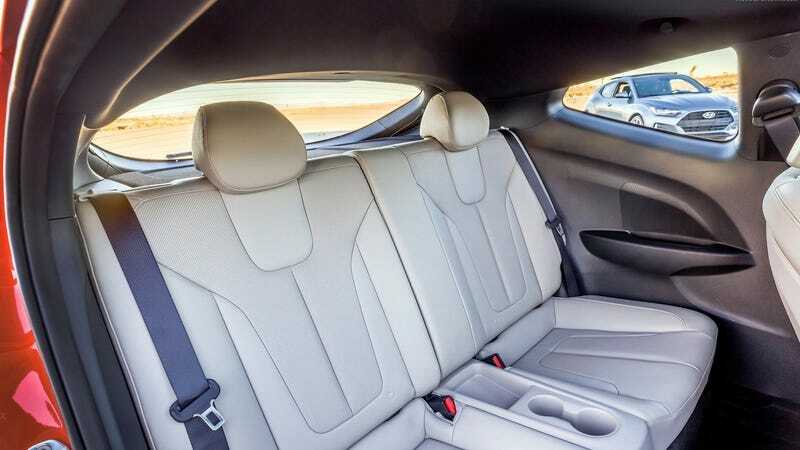 But I also kinda hate it, because this is what you see when you look into the back seat area of a 2019 Hyundai Veloster. It doesn’t have to be this way, Hyundai! The original Veloster had a 2-piece glass hatch like a Prius (or EF CRX). While the sloped roofline didn’t exactly make for a great view out the back, there was at least a lot of glass to help it not feel quite so claustrophobic. It also had a panorama sunroof that was the full width of the roof, and had a small extra bit of glass behind the movable glass panel. Look at all that glass above and behind you as you sit in the original Veloster! But on the new Veloster, Hyundai got rid of multiple pieces of glass from the old one. Not only did the rear hatch lose its extra glass, the sunroof also did. It’s still a quasi-panorama roof but now it’s just a large regular sunroof without the extra fixed piece of glass. While the sunroof doesn’t help the rear visibility, at least it helps make the cabin of the new Veloster feel more open and airy inside. But the Veloster N doesn’t let you choose the sunroof as an option. The only option is the Performance Package—which is a great package!—but that doesn’t add any more glass to the car. If you want a Veloster N, this is all the glass you get. And now, time for some forbidden fruit. The goddamn i30 (a.k.a. Elantra GT) N gets a panorama sunroof option. So not only does it have a much roomier back seat and trunk than the Veloster N, and a regular upright back window you can actually see out of, nearly the whole roof can become a sunroof too. Look at all that glasssssssssss. Hyundai USA, I’ll make you a deal: bring us the i30 N with the panorama roof, and I’ll buy one!